RECTBOX is a staff recruitment tool designed by solutiondots systems. We provide you one of the best cloud-based recruitment software to prosper your organization. Our system helps to hire the most consistent and authentic staff. Recruitment CRM streamlines every process from job posting to hiring a person. It eliminates the troubles and time wastage of finding the right person for a vacant position. Our system is smart enough to engage and appeal applicants for the job openings. You can easily install our web-based system on your desktops or mobile devices (android/iPhone/ windows based). RectBox Parsing engine helps in extracting all relevant information from every possible platform and document. Our powerful parsing engine extracts relevant data and stores it in the database. It’s a recruitment automation software which helps you to combine extracted information and review all the information’s at one platform. Online recruitment software helps from posting jobs to reviewing resumes and interviewing candidates. Our software automates the entire candidate search and hiring process. 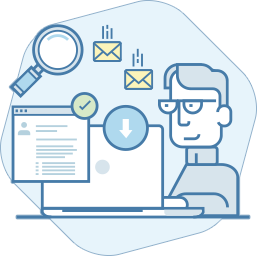 Our software offers a powerful resume and candidate tracking functions, the software makes it easier for you to find and hire right employees at right time. Streamlines all operations and centralizes the worthy information. Our recruitment software is a cloud-based system which is featured to store all candidates inform in records. Due to RETBOX cloud-based feature it easy to access candidate’s information whenever required. It assists small business, educational setups, Hr personals, companies, and staffing agencies in hiring potential staff.